In the South African blogging industry, there are very few bloggers generating a full time income from their blogs, and most of us have full time jobs whilst trying to juggle our blogs. When you add kids, piles of dishes, dogs and cats that need cuddles, washing and ironing, to the mix, it almost seem like it is impossible to grow your blog whilst having a full time job. Here’s the good news, though! 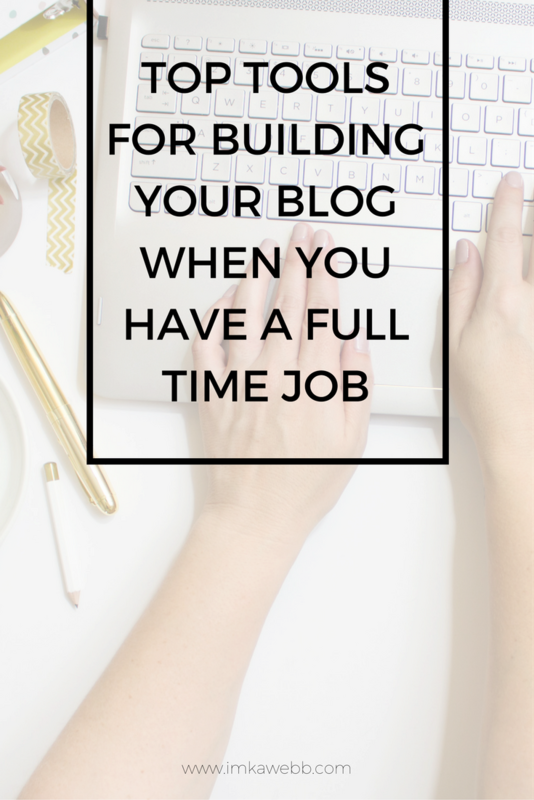 It is possible to build and grow your blog, even if you have a full time job. Like you guys, I also have a full time job. I work as the digital editor for one of SA’s most loved magazines, which means that blogging during working hours is non-existent! But, in 2015, I still managed to grow my blog. In fact, I tripled my traffic during the last 4 months of 2015. So, exactly how did I do that? The simple answer (and probably not one that any of you are expecting) is that I made time for my blog after hours. Now, don’t click away! I know that “making time for your blog” is not the answer that you were looking for, but hear me out. The truth is, that if you are serious about your blog, you will take time out of your day to build your blog. In this post, I will discuss the time-management tools I used to grow my blog whilst still keeping my full time job (and still having time for my husband, family, friends and a neat and tidy home). I work according to a 2-week blogging schedule for Glamorous Glitter. My plan and write my post two weeks in advance and schedule them for upload. Scheduling my posts for automatic upload is a great way to save time because I don’t actually have to go onto my blog on the day I want to publish the post and click “publish”. I can rest assured knowing that my post will go live on the date and time I set and leave it at that. I simply cannot blog without an editorial calendar. The key to my blog-two-weeks-ahead success is that I keep a pretty informative editorial calendar. I have each day and each platform carefully planned out two weeks in advance. I know exactly what needs to happen on which day and what needs to be uploaded when. I created my own editorial calendar template and I find that it works really, really well for me and covers my needs perfectly. I use Google Docs to edit and save my editorial calendar so that I can have it handy wherever I find myself. Just like I schedule my blog post, I also schedule my most important social media posts. My social media schedule also works two weeks in advance, so I have a clear view of what to post when on which platform. As soon as I am done writing a blog post, I immediately schedule my Twitter and Facebook posts on Hootsuite. Here’s where my post on writing the perfect URL for blog posts come in handy. Because I know in advance what my URL for a scheduled blog post is, I can use that URL when I schedule my social media posts for Twitter and Facebook. I also make time to schedule the content from others I want to share with my readers. Hootsuite is one of the best (and mostly free) social media management and scheduling platforms out there. I use Hootsuite to schedule posts for Twitter and Facebook, but they also have the option available to schedule posts for Pinterest, and many other social media platforms. Another tool I use for scheduling my Pinterest is BoardBooster. With BoardBooster I can upload my own pins and schedule a time and date for it go live. I can also create a secret board with awesome pins and schedule a select few to go live at a certain time. I make time once a month to add pins to my secret board for scheduling and then I forget about it. I know that with BoardBooster, everything is taken care of and I can grow my blog traffic with Pinterest without lifting a finger for the rest of the month. I absolutely love using BoardBooster and for just $5 a month, it is an absolute must-have tool for growing your blog. Sign up to BoardBooster for FREE here. Another way I save time is by creating templates for my blog posts and all my social media channels. I mostly use Canva for creating images for my blog, so I have saved a few templates for blog posts and each social media platform on there. Now, whenever I need to design an image for a blog post, I quickly change the wording and the background of my templates and voila! Within less than 30 seconds I have a new, high quality image to accompany my blog post. If I need a social media image, I spend another 30 seconds and design one. Seriously, in less than 5 minutes, I can create a blog post image, and an image for each social media platform I use. If you are looking for beautiful, and (mostly) free stock photography for your blog images, check out this post: Free Stock Photos for Blogs. Ah, the G word. Goals. At the beginning of the year, I wrote down a few of my top blogging goals (I’m sending out a freebie with my newsletter this week, so subscribe, subscribe, subscribe). During the course of the year, I will look at these goals to keep myself motivated. Whenever I lose the will to blog, or wonder why I am blogging in the first place, I like to take a look at my goals. Seeing these written out on paper, makes me feel like it’s much easier to accomplish than I ever though possible. I also use my goals to keep me accountable. It’s Sunday, you’re lying on the couch, just chilling, drinking a cup of coffee. That, dear reader is the perfect time to whip out your laptop and start writing your blog posts. I find that I write my best post when I am relaxed, and that is usually a Sunday evening for me. Even if I just edit my editorial calendar when I have a spare moment, or take and edit a picture or two, or write the skeleton for a post or two, I feel accomplished knowing that I worked on growing my blog. Truth is, I make time for blogging in my schedule. And that’s basically the whole point of this blog post. If you want to turn your blog into a full time income, you will have to make time for your blog. Yes, there is a few tools to build your blog when you have a full time job, but to be successful, you’re going to have to make time to blog. Simple as that. What tools do you use to grow your blog? Let me know in the comment section below. *This post may contain affiliate links. All thoughts and opinions are my own.